Each of the the Degradation films highlight characteristics specific to motion picture film. In this film, two 19th century technologies collide: a record needle and celluloid film. Over a period of one hour, the emulsion of a film loop and its optical soundtrack are scratched nearly completely from its surface by a "modified" record needle. With filmmaker Paul Bishow, the record needle was transformed by reinforcing the needle arm with an additional metal extension. The film loop was scratched as it entered into the gate and digitally captured during the degradation process. The film was then transferred back to film. In it's final form, this process is followed in 7 different parts at approximately 10 minute intervals ("x loops, x minutes...). The soundtrack of Degradation #2 is a mix of the sound produced by the record needle and the original optical track. While the source material speaks of mining, digging and drilling, in its celluloid state, it now looks and sounds as though it is being tortured into expressing itself by the sound of the destruction of its own image. 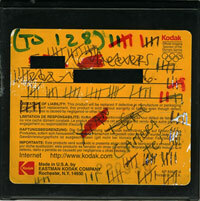 One hundred feet of un-shot 16mm (Kodak-7289, 800ASA) film was cut into 6 equal parts. Each piece was boxed separately and passed along to airline passengers to be placed in their check-in luggage. As they traveled, the boxes were separately subjected to x-ray checks 0, 4, 8, 16, 32, and 64 times. 23 carriers, an innumerable quantity of anonyous security personnel, and the cumulative radiation render the emulsion of Shroud of Security virtually transparent. Violet's soundtrack accords the agitated grain a pulverized soundtrack. For this second x-ray experiment, the first step was to film the US Capitol on 100 feet of 16mm film (Kodak-7205, 250 ASA). Then, using a process similar to that of Shroud of Security, the film was cut into 6 equal parts and passed through US Government security X-Ray machines in Washington DC 0, 4, 8, 16, 32, 64, and 128 times. The result is a gradual effacing of the image. Sound by Violet (aka Jeff Surak).